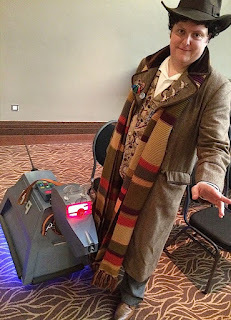 I headed back to Slough today for the second Day Of The Doctors convention. For me, last year's was a stalking horse event with a number of surprisingly interesting guests, all of whom were connected by having played The Doctor in one for or another, no matter how tenuous. So I'm attending today very open minded to what's on offer and what may be instore. Headlining is Tom Baker, who will be doing photoshoots, with and without Matthew Waterhouse and Geoffrey Beevers, as well as spending the rest of the day signing autographs. Sadly he's not doing a stage talk. The morning is given over to an endless list of photoshoots, as well as autograph opportunities. I'm only going for one photoshoot with the Troughton brothers, David and Michael. I've never met them before and it's a wonderful chance to meet them both together. While waiting for my call for the photoshoot, I gathered a few autographs in my book. Edward de Souza, was notable for starring as Marc Cory, the lead character in the only Doctor Who episode to not feature The Doctor in any shape or form. Also starring in Mission To The Unknown was Jeremy Young, who was signing autographs next to Edward. 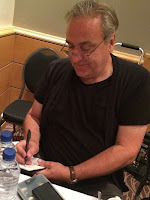 Next to Jeremy was David Garfield, who appeared in Leela's introductory story, The Face Of Evil. The moment I walked in the room I saw David catching my eye. 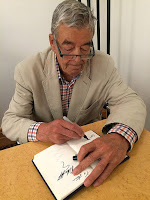 I wondered if he had recognised me, as some twenty-five years ago I visited him a this home to interview him about his fleeting appearance in The Prisoner. He only had one line, but his memory of filming it was clear as day. He delivered the line perfectly, but his shot finished with a crash zoom on his face, but the crew had a problem with the camera and there was a shudder, ruining the shot. After over 30 takes they finally got it right. David remembered me visiting him and we had a good chat about it. Also attending is Sylvester McCoy, and although I have him in my book already, I want him to sign something special for me. Back in 2010 I attended the Bonhams Doctor Who Auction and bought the Seventh Doctor hat and handkerchief lot. I subsequently sold the hat and two of the hankies, keeping one for myself which I have framed on the wall of my workshop. 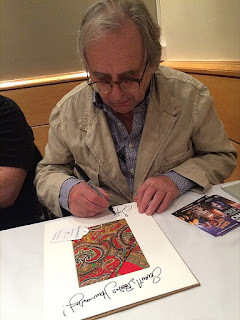 I asked Sylvester to sign the mount, titling it with SEVENTH DOCTOR HANDKERCHIEF, and signing his name at the bottom. 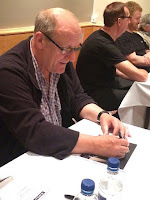 Next to Sylvester were the two Troughton brothers, so I got them to sign my book on a page prior to where I have the autographs of their father's three companions, Frasier, Wendy and Debora. 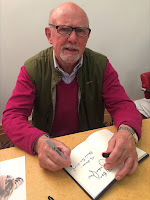 Chatting to David it emerged that in the 1970s I had attended the same theatre club at the Arts Theatre in London. The brothers were at the Unicorn Theatre during the early 1970s, and I was there for the latter part of the same decade. At 2pm it was time for us all to take our seats for the interview panels, which took up the rest of the day’s proceedings. 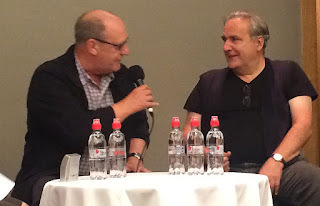 The organisers of these conventions have learnt (maybe to their cost) that it is near impossible to wrangle Sylvester and do a sit-down interview with him. So, at the very outset, all they did was introduce him, hand him a microphone, and set him loose on the audience! 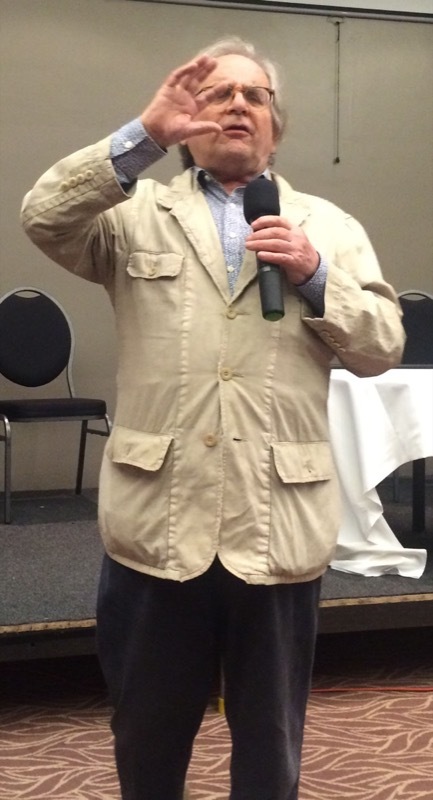 In this format Sylvester is in his element, walking around; meeting the fans; holding the microphone so they can ask questions; then going off on his entertaining tangents before finding another eager fan to ask a question. He talked about filming Survival and how hot it was on location. he felt sorry for the extras all dressed as leopard people with thick fur costumes on. Finally one of the extras got claustrophobia and stripped her costume off before running over the sand dunes never to be seen again. Sylvester told the ever popular tale of filming with Daleks under the arches of Waterloo station where the explosive special effects were mistaken for an IRA terrorist attack. Someone asked about Dimensions In Time, and Sylvester remembered working with Louise Jameson. Shot in a weird form of 3D, it required the camera to be constantly moving to sustain the illusion of depth. So for his scene the camera encircled the pair of them, twisting the leads around their ankles. He didn’t seemed too upset at being pressed close together with Leela! 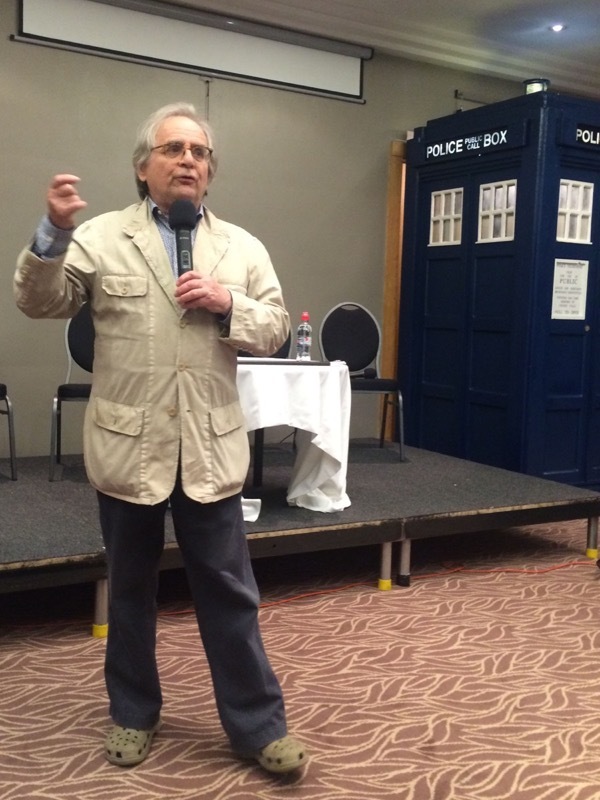 The subject of sonic screwdrivers came up - something his Doctor never had, so when he was required to use one briefly in the tv movie he wasn’t sure how to use it. As it turned out he was holding it back to front and the producers had to blur the head of the sonic to disguise Sylvester’s ignorance of how to use it! Finally the subject of his costume came up and to illustrate what he was talking about, a cosplayer in Seventh Doctor costume was pulled from the audience to model for him. THE HAT he explained was his own trademark and he wore one to the audition. It seemed natural for him to wear one in the part. THE UMBRELLA was partly Sylvester’s idea, and he seemed quite pleased with the result. THE PULLOVER was not his choice, and the excessive question marks all over it was a bit to blatant for Sylvester’s liking. He much preferred the waistcoat worn in the tv movie. THE JACKET was nice and simple, but at his request it was given large pockets. These he used to keep his script pages, having them from one side to the other as they were finished with. This panel was undoubtedly the highlight of the day for me. I've been aware of the two Troughton brothers in a variety of productions down the years, and they have both made appearances in the new Doctor Who: first David in Midnight, then more recently Michael in Last Christmas. You could feel the sparks of brotherly connection between them from the moment they sat down, playing with the interviewer as to which was which, leaving him and the audience confused from the outset. Michael had written a biography of his father, so he took the lead discussing their dad. 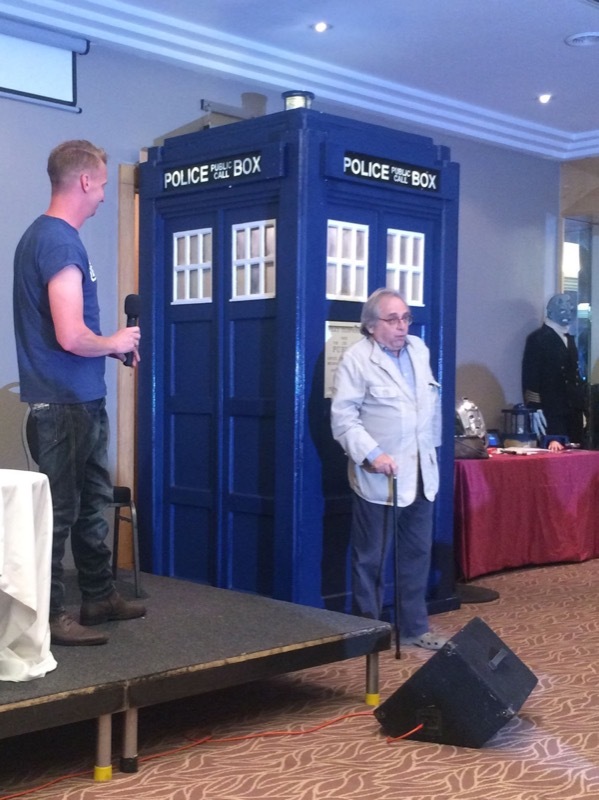 He talked about how prolifically he had worked, playing untold character parts for years prior to Doctor Who. The series had taken its toll on him, both with his nerves and private life. He was terrified of being typecast and never working again, something which his IMDB page clearly proves was unfounded. 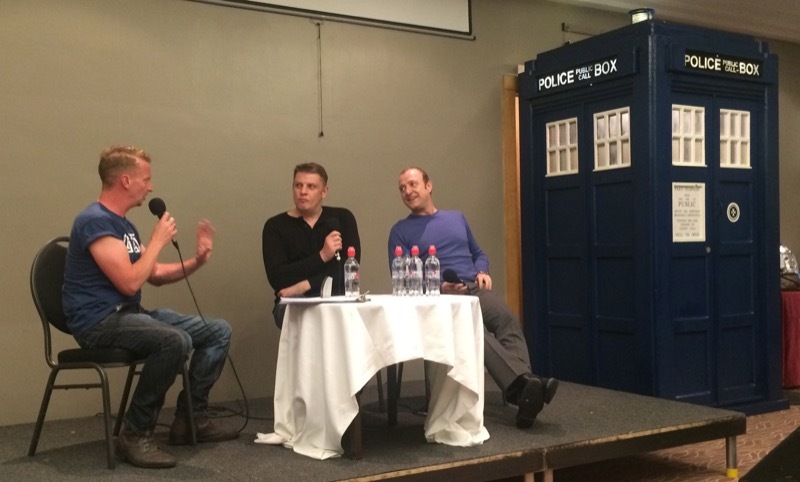 Interesting as this panel was, it didn't keep my attention for very long. 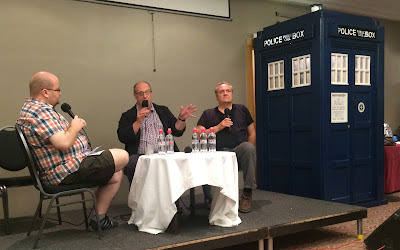 Both voice actors are very skilled, but I struggled to maintain focus as they told stories of being repeatedly asked to do comical impersonations of a number of Doctors. Big Finish are nothing if not prolific, but I still do not accept their work as being canonical to the main series. 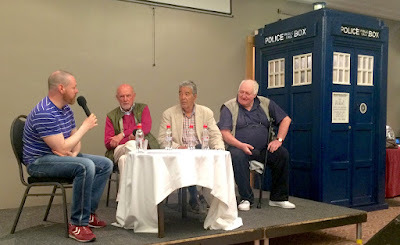 I was quite looking forward to this panel, as all three actors had played character parts in a lot of films and tv series I love from the 1960s. Edward de Souza, of Portuguese and Indian heritage, starred in a couple of Hammer films (The Phantom Of The Opera and Kiss Of The Vampire) plus a number of appearances in The Avengers. He had an Avengers-off with Jeremy Young who also had made multiple appearances. Edward recalled Joanna Lumley, who he would say “Hello LumLum, show us your bum bum”. She never did apparently. They both remembered Patrick McNee fondly, though Edward chipped in that he was a nudist and went to America. “He’d show you his bum bum”. This panel proved to be a gem - not for anything of significance that came out of it, but just simply to watch Matthew make his usual prat of himself. 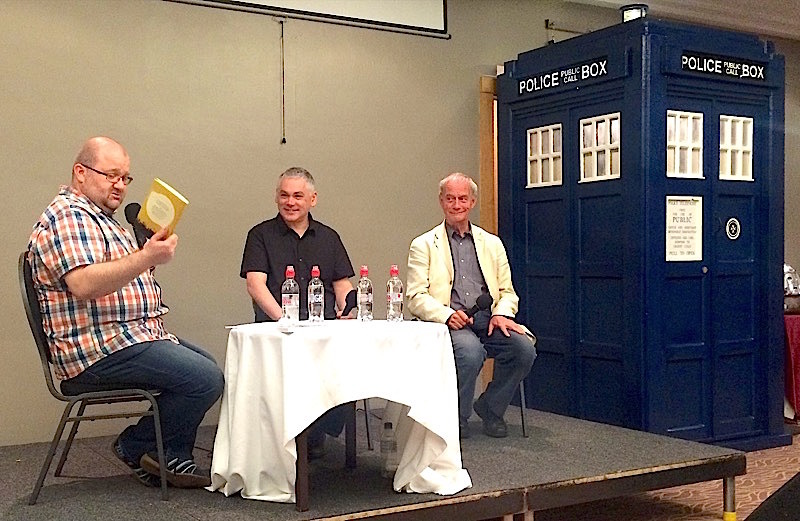 The panel opened with discussion about how each were writing novels. Yes, you did read that right. Mathew would apparently speak his book into a recording device, performing the unfolding text like a live show akin to a talking book. Geoffrey, on the other hand, would just write it down. By all accounts Matthew's finished book was quite tortuous, centring on a love story that sounded like teeth being pulled. 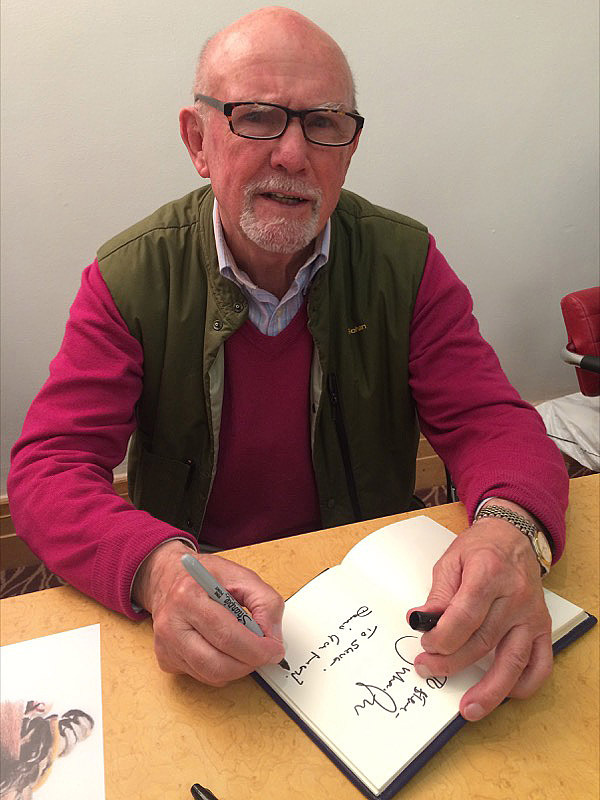 Geoffrey had written a piece in the 1980s, only publishing it now. Beginning in a monastery, it explored how the past views the future, and the future views the past involving a non-sci fi time travel. Sometimes these a lot to be said for print-on-demand self publishing, and sometimes there is not. 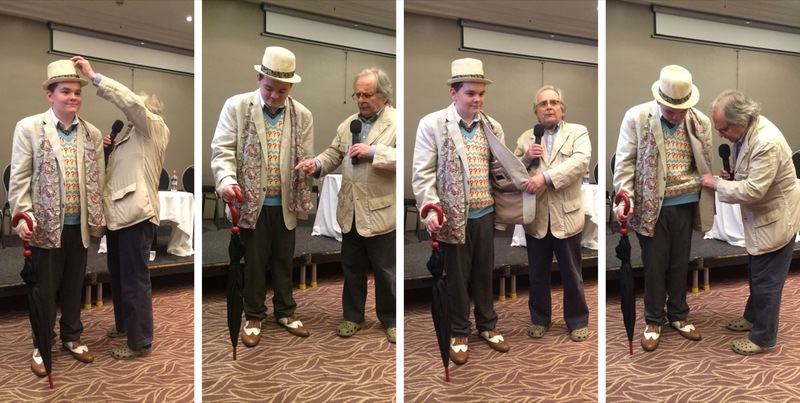 The day ended with the usual cosplay competition which was won by the Ood! As always a brilliant break down of the day. An especially good read as I couldn't make it! My only question is what did you wear this time?! Oh lordy, I sorta forgot to mention that! I actually wore my new Capaldi velvet coat for the first time and I was stopped by someone who said "You're cosplaying a costume not even seen on tv yet! HOW have you done that?" I smiled. I left it to the others to do the cosplay. 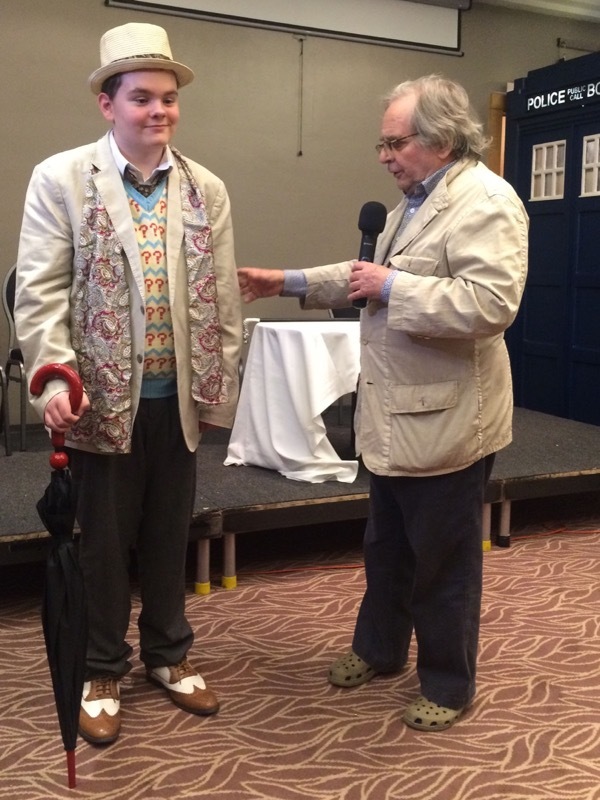 I was in Capaldi's new velvet coat. Amazed how few people got it. The same happened in the US when I wore my cashmere frock coat for the first time (prior to it being on screen). No-one knew what it was!